Introduction: A leading investment bank in Saudi Arabia that offers traditional wholesale, retail and commercial banking products. Challenges: The Need for greater flexibility and agility in an increasingly competitive market and regulatory changes that cannot be adequately handled by legacy systems. 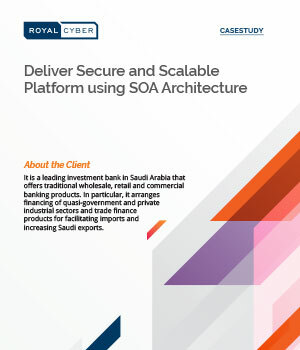 Solution: Royal Cyber implemented SOA architecture using IBM middleware/integration solutions to overcome the business challenges of the client.